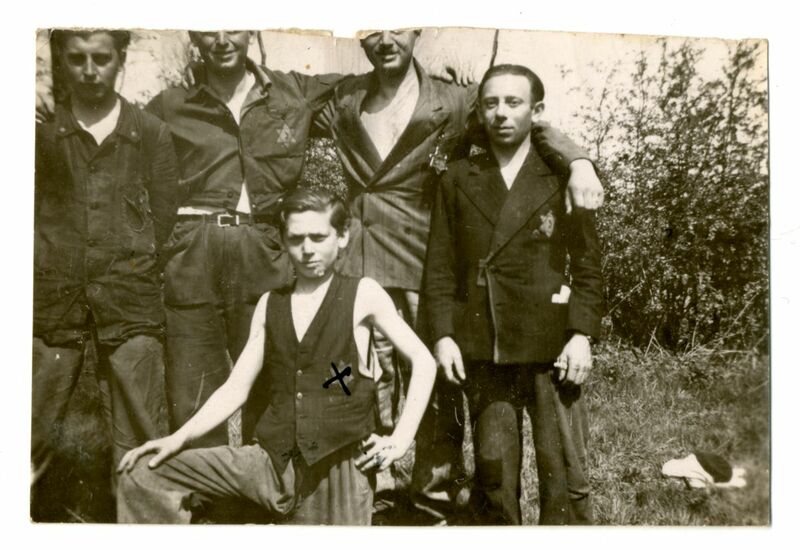 This collection contains an audio interview of Anna Erlich-Liberman and 22 photos of : the Liberman-Weinberg family, including their three daughters Bertha, Julia and Rosalia Liberman ; siblings Anna and Rosa Erlich ; Vital Bertrand Lieberman and comrades at the Les Mazures camp in France ; Anna Erlich and her friends at the home of the Jewish Association (AJB or Jewish Council) in Lasne ; pre-war photos of Erlich and Liberman family members whom remained in Poland ; pre-war photo of Fryda Liberman ; post-war photos of Anna Erlich, her husband Vital Bertrand Lieberman and other family members ; group photo of the members of the National Friends Association of Political Prisoners of the Dannes camp. Digitally stored at Kazerne Dossin ; KD_00365_000011, KD_00365_000012, KD_00365_000014 and KD_00365_000015 are physically stored at Kazerne Dossin. Anna Erlich, private collection, Antwerp ; KD_00365_000011, KD_00365_000012, KD_00365_000014 and KD_00365_000015 are physically stored at Kazerne Dossin. Anna Erlich was born in Antwerp on 12 June 1928. Two years prior her parents, Szymon Michal Erlich (18 March 1899, Warsaw) and Fryda Liberman (20 April 1895, Pultusk) had moved from Poland to Belgium. Fryda’s brother immigrated to Antwerp before the First World War and had been able to get visa for his family, including his sister Fryda. In Antwerp, Szymon and Fryda raised two children : Anna and her sister Rosa (31 May 1927). Szymon manufactured handbags and was economically active as a merchant at local fairs and markets, and later opened a shop for handbags, socks etc. He also served as a cantor in the local synagogue. Fryda worked in a shop. After the outbreak of the war the family tried to escape the city. However, since Szymon yearly in April bought the stock for his business and payed it in cash, the family did not have enough money to flee. In July 1942, Szymon Erlich was assigned to forced labour (Organisation Todt) at the Atlantic Wall in the north of France. His wife and daughters sent him food parcels, but received minimal financial compensation for his labour. Szymon Erlich was deported from France to Auschwitz-Birkenau via transport XVII. He did not survive. In Autumn 1943, Fryda Liberman and her daughters were at home when the Sicherheitspolizei-Sicherheitsdienst (Sipo-SD) came to their house. Anna was transferred to an orphanage of the Jewish Association in Belgium (AJB or Jewish council), while Fryda and Rosa were arrested. Fryda was subsequently sent to the hospital, where she died of a heart condition on 13 November 1943. Rosa was taken to the Dossin barracks. She did not survive deportation via transport XXIII on 15 January 1944. Anna stayed at the orphanage in Lasne during the war. She and the other children at the home were hidden after the Nazis visited the institute just before liberation. Anna did not only lose her parents and her sister, but also her maternal uncle Moszek David Liberman, her aunt Amalia Weinberg, her five cousins, and numerous other family members. After the liberation, one of Anna’s paternal aunts, whom had survived the war in hiding in Belgium, took her under her wings. In 1947, Anna married Vital Bertrand Lieberman. Vital had also been deported to France as a forced labourer and was detained at the Les Mazures camp. He survived deportation from Drancy, France, to Auschwitz-Birkenau and was repatriated to Belgium in 1945. The couple had three children. Anna became very active in communal affairs and the Zionist movement in the post-war period. She still lives in Antwerp. Digitisation of this collection was permitted by Anna Erlich-Liberman after she was interviewed by dr. Veerle Vanden Daelen, deputy director and curator of Kazerne Dossin, on 6 January 2017.